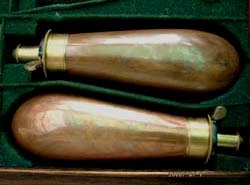 A very good reproduction leather Wogdon style powder flask, made in our own workshop, with pull off measure. Overall length 13cm. - 4.5 cm wide x 3 cm. A best quality reproduction 3 WAY POWDER FLASK, made in our own workshop. Non adjustable powder charger shell ball cover, sliding base for flints. Black leather covered. 4.5" overall height. Because this flask is MADE TO ORDER the height can be altered to fit your case compartment.